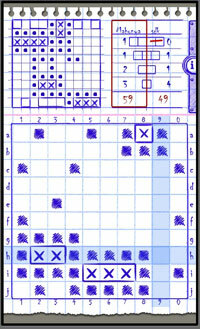 Play classic battleship game from your childhood, just like it might had you played it in your maths book at school. Sink enemy ships, collect stars and earn ranks, become Admiral of the Fleet! Setup your battleships, then fight against your droid or on the Net with people all over the world. For those who missed this fun earlier - the objective of this guess and shoot game is to find and sink all enemy ships. Stars and ranks for each victory, from seaman to Admiral of the fleet. Single player fights with your Android. Three difficulty levels of Android AI to suit you best. Hotseat mode. If your friend doesn't have Android device, now you can play together on your phone with hotseat mode. "Good news. Now you can experience all the fun of an epic strategy game for the ages on your Android with Naval Clash Android app, complete with retro-chic hand drawn graphics and honest to goodness grid paper background. Round up your cruisers and hide your air craft carrier well, it's time for the Naval Clash..."